I built a stylish energy-efficient desk lamp, entirely from scratch. I have always enjoyed Art Deco and Machine Age industrial styling, and was inspired to use it for the lamp when my son and I were watching Batman, the Animated Series. A desk lamp worthy of Wayne Manor was in order. The thing that originally prompted me to build a lamp was a broken computer scanner. I took it apart and removed the cold-cathode fluorescent light, and thought to myself “this would make a cool lamp”. And efficient too; putting out a lot of light at only about 5 watts as I recall. I envisioned a long thin tube light at the end of an arm, which could be swiveled and positioned as desired over the desk. I made a shade for the tube from copper plumbing pipe. 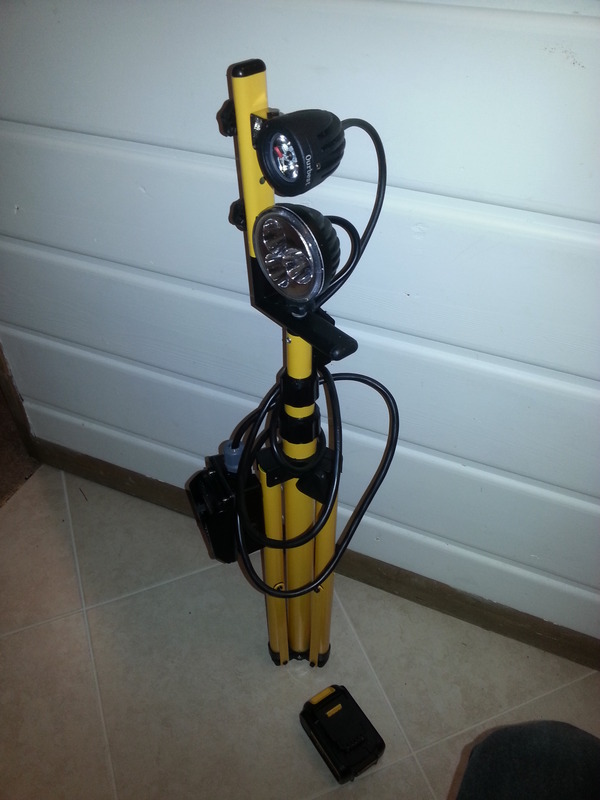 The CCFL inverter would be placed in the base of the lamp, along with a 12v power adapter and a few yellow LEDs to make the base glow. As in most of my projects, I started the base with some sketches and then a cardboard model. I built it from acrylic plastic, cut on the table saw and bent by heating with the heat gun. I sanded it with fine sand paper, to change the gloss finish to a matte. Then I painted it with black vinyl dye. Although it looks more like an Art Deco radio than a lamp, the result is still pretty good I think. It was just big enough to fit the 12v power supply, the CCFL inverter, a power switch and a few LEDs. Only one problem: it weighs nothing. Not good for the base of a lamp with metal arms and head. A heavy piece of steel in the bottom solved that. I built the arm using 3/8″ chrome-plated copper pipe. The sections are connected by ball joints made from short bolts, with the heads rounded off using a file in the drill press. I first thought I needed to tap the tubes for the bolts. Then I found the copper was so soft the bolts would tap themselves. The relatively-small contact area of the ball joints makes them somewhat weak. This means the lamp shade should be as light as possible. 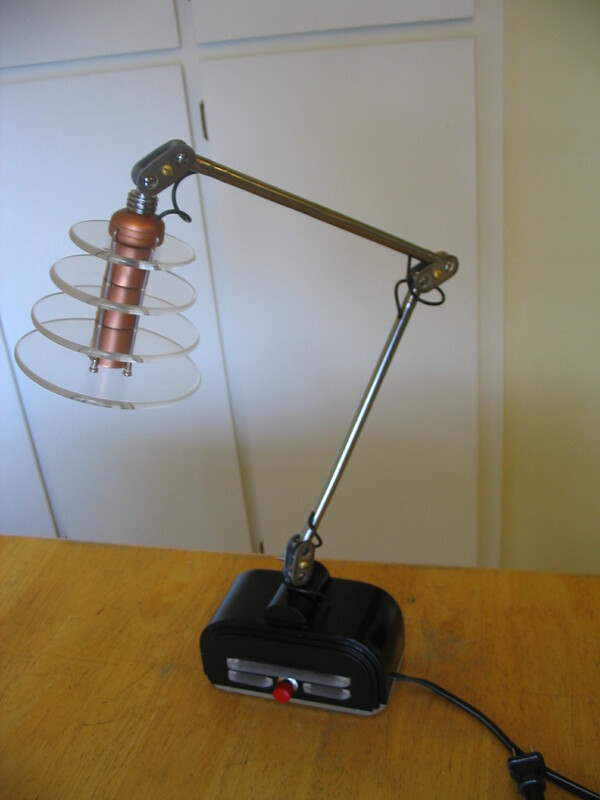 Once I had the base, arms, and CCFL lamp built, I assembled them together and soldered the CCFL bulb on the end of the wires running through the arms, to the CCFL inverter in the base. First try: Oh no! It didn’t work. The tube just glowed dimly on each end. I checked all the connections; no help. I disassembled it and connected the tube back directly to the inverter. It worked. Huh?!?! I determined there was nothing wrong with any of the individual parts or wires; they just didn’t work together. I could not get the lamp to work with the inverter in the base, away from the tube. Argh! Frustrated, I set the project aside for quite a few months. 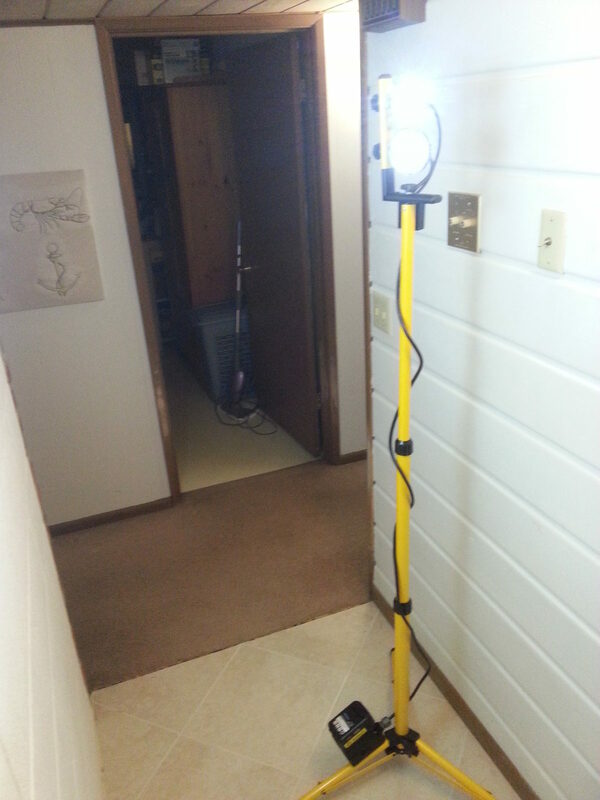 In my quest for high-efficiency lighting, I came across a new idea for small household lights. "And did you live?" "Did I? You should see me now!"